One of our favorite things to do in the summer is to visit my cousin Angie over in Aptos. This day, I begged her to let us visit. She was working on costumes for the 4th of July parade, and welcomed the help. After we finished creating a large shark for Dereck, we decided to walk down to the beach. There were great white shark warnings that day at Seacliff, and we were hoping to see some fins. The kids were excited at the prospect of seeing sharks, but after 10 minutes of looking they were done. So, they ran down to the beach to play in the waves. It was there that the kids saw pelicans and seals. But, still no sharks. Angie and I sat in the sand and watched the kids, not even worried as they splashed in the waves. The shark helicopter flew over head and circled the area where the sharks were. We had no fear. 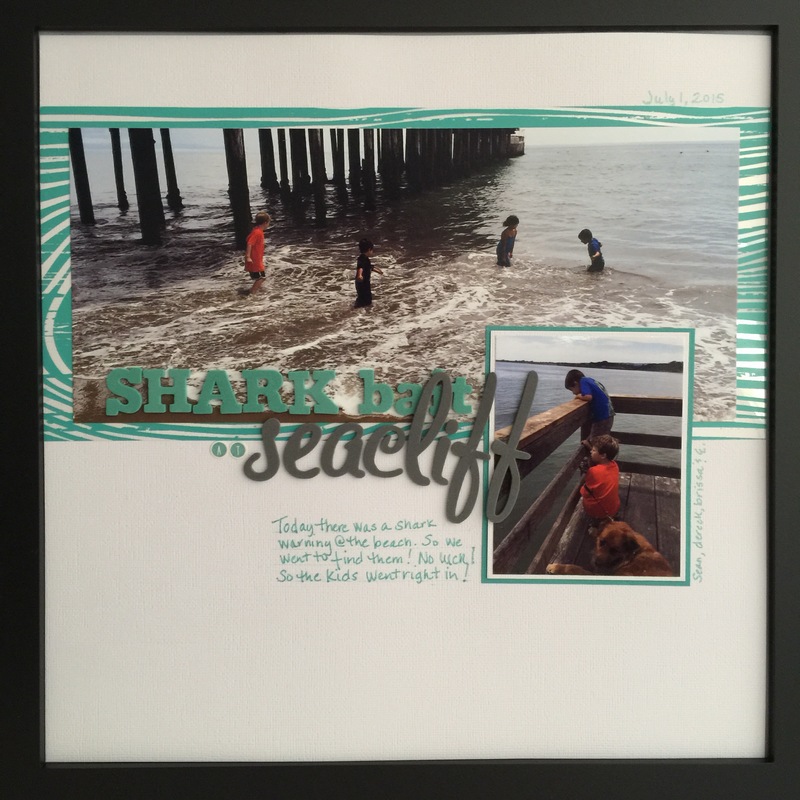 I really wanted to focus my layout on the carefreeness of the kids, enjoying the ocean with no fear. I’m still stash busting, so I went to my Hambly stock and picked out this teal wood overlay. It reminds me of waves. Then to my Thickers I went. My only sadness, no upper case “T’s” in the teal letters. Bah. The gray Seacliff accents the lo beautifully. So simple, but so effective. Woo hoo! Another story down!